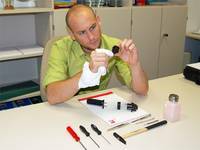 To assemble optical fibers and cables many different tools are required. We are able to offer the right tools for almost all requirements. In addition to fiber strippers and crimp pliers, we offer polishing holders for all common connector systems. Most of the Cleave tools were developed for SMA, ST and V-PIN connectors. To guarantee that the tools are working within acceptable tolerance limits - especially when in permanent use - they have to be checked periodically and expendable parts replaced. To combine your repair and maintenance work with the least amount of effort on your part LASER COMPONENTS has opened a service center for these tools. We are happy to send you an individual offer any time. Please call us or send us an email.